I was given Bobby Flay’s Burgers, Fries, and Shakes Cookbook a while back – probably when it first came out and I admit, I haven’t cooked much from it. But what I have cooked from it has been absolutely delicious. 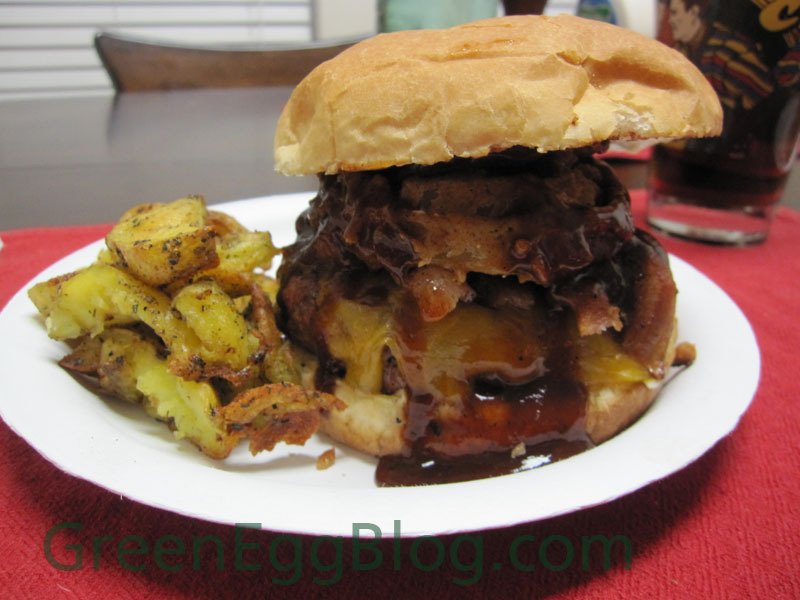 The Cheyenne Burger is among the most intensive in the cookbook because of all the different elements – homemade BBQ sauce, Onion Rings and then the Burgers. 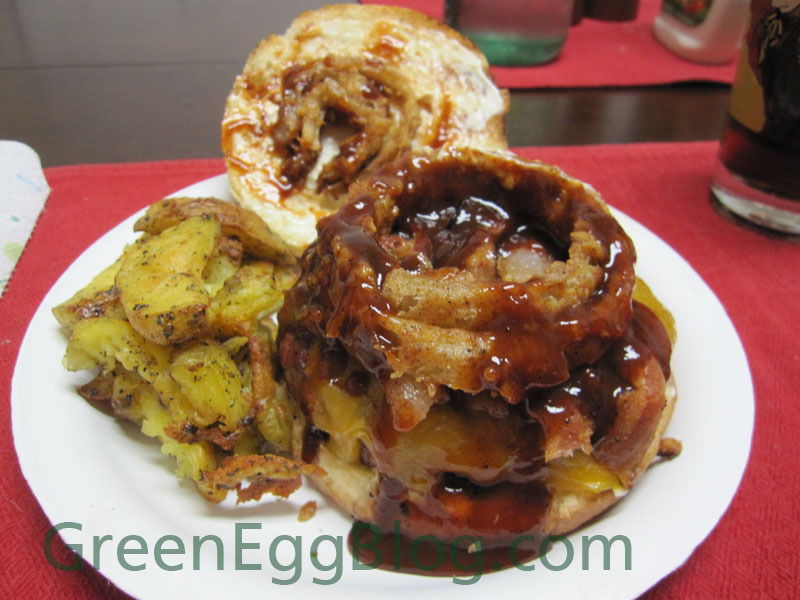 In my case, since I already have a ton of BBQ sauce laying around, I went with just making the Onion Rings and Burgers. 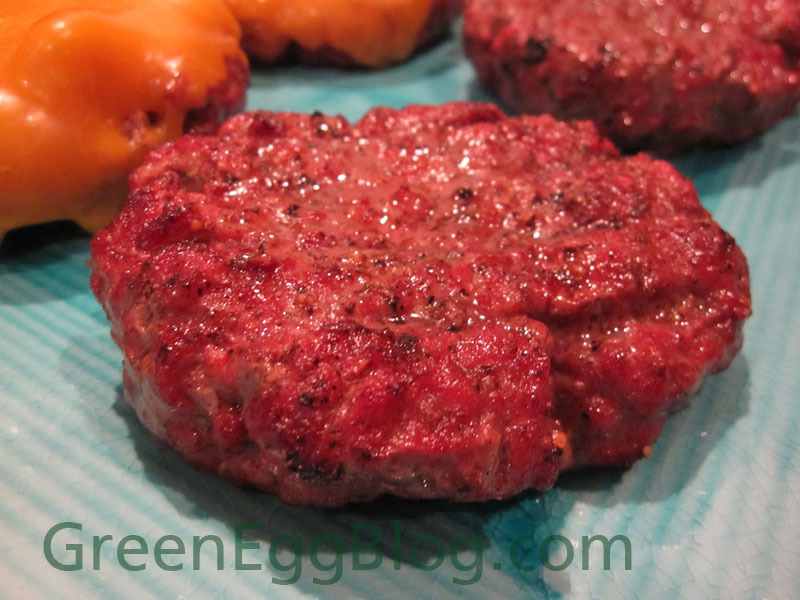 Prepare the BGE for indirect (yes, indirect – how do you think my burgers got so pink?) using the plate setter and get it to about 400-500 degrees. I also used Hickory wood chunks for smoke. Soaked them over night and placed them on the lump before adding the plate setter. 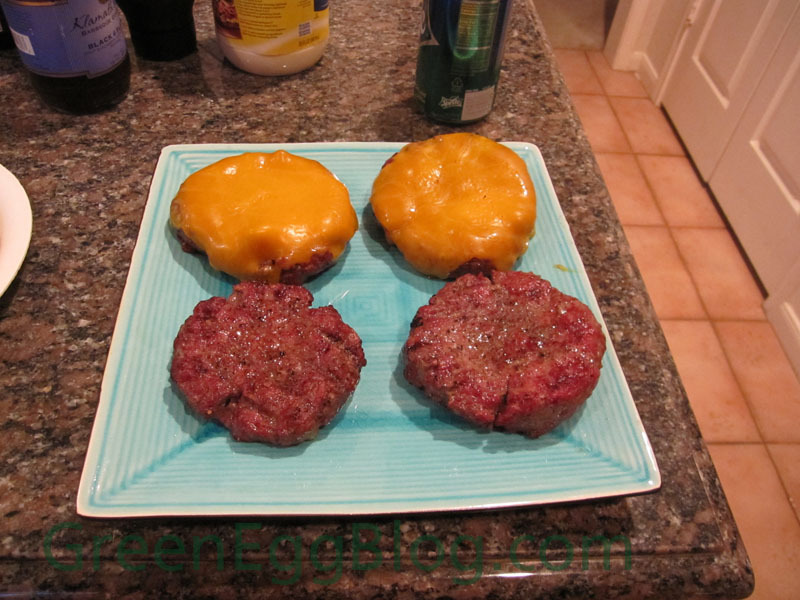 Cook the burgers 3-4 minutes per side (depending on your BGE temp and desired level of doneness) and topping each one with a slice of sharp cheddar cheese during the last minute of cooking. Heat the oil in a heavy bottomed medium stockpot over medium heat to 375 degrees F. Line a baking sheet with paper towels and set aside. 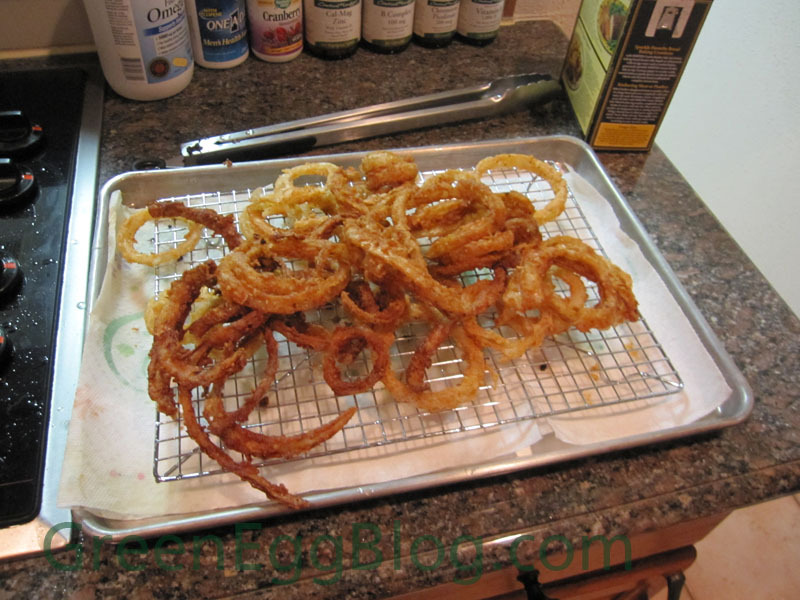 Working in batches, dredge some of the onions strings in one of the dishes of flour and tap off the excess. Dip the strings in the buttermilk, allow the excess to drain off, and then dredge the strings in the second dish of flour, making sure to coat the strings evenly. Tap off the excess and transfer the batch of coated strings to the hot oil. 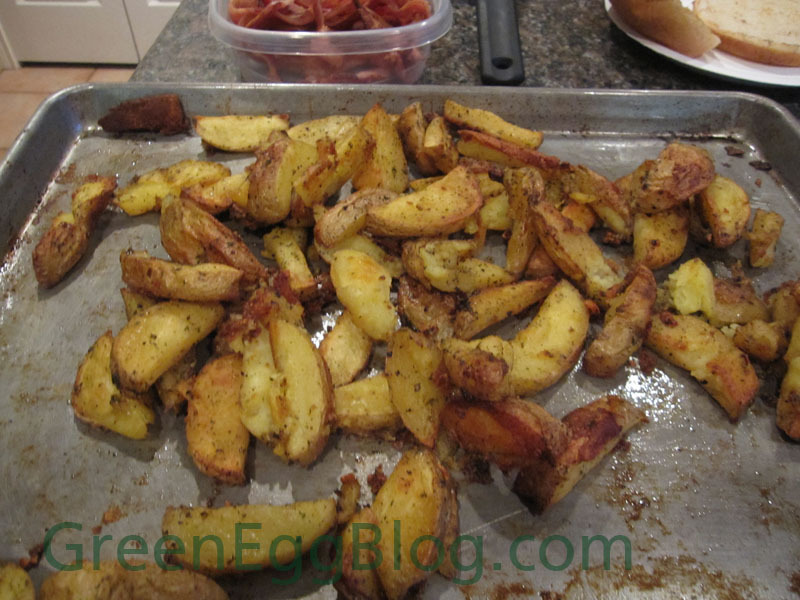 Fry the strings, turning once or twice, until golden brown and tender, about 4 minutes. Remove with a mesh skimmer and drain on a baking sheet lined with paper towels. Season immediately with salt. Repeat until all of the onion rings have been cooked. Serve hot. So was all of this cooking worth it? Absolutely – the burgers were amazing. Something I would only cook on special occasions, but fantastic. And I don’t even order burgers with BBQ sauce – I like mine with jalapenos, pickles and bleu cheese when I can find it. So for me to convert to a “western” type of burger is a big deal. Try this one out – you’ll be glad you did!